All undergraduates are given abundant opportunities to acquire and strengthen nine Essential Learning Outcomes by the time they graduate. These outcomes provide a foundation for a successful professional and personal life. Graduates are able to display improvements in perception, thinking, feeling, and overall growth of consciousness. 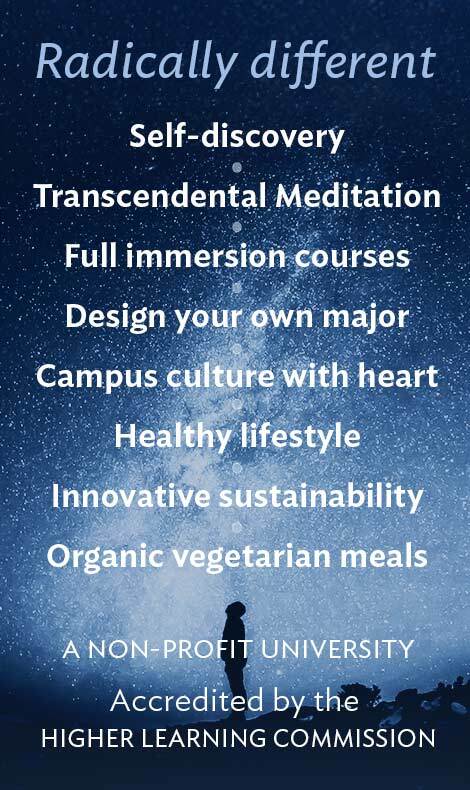 These improvements are verified through both subjective experience and objective measures — through self-reported experiences in and outside of Transcendental Meditation practice, measures on the Brain Integration Progress Report, and behavioral indicators of mental and physical wellness. Graduates are able to display a healthy and optimal quality of life that allows them to get through their daily activities without undue fatigue or physical stress. This outcome is measured through a standardized assessment developed by the Centers For Disease Control. 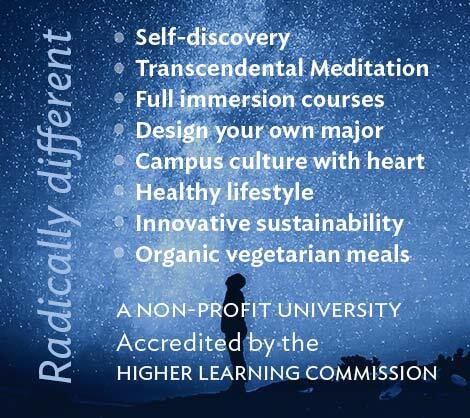 Graduates are able to apply unifying principles within and across disciplines to synthesize ideas, integrate divergent perspectives, and understand what they have learned in light of their own consciousness. This outcome is assessed in the Senior Project, where students reflect on their work using the integrating principles that emerged in the process. Graduates are able to combine or synthesize existing ideas, images, or expertise in original, imaginative ways characterized by innovation, divergent thinking, and risk taking. This outcome can be measured as a dimension of any product which requires originality and imagination, going beyond what is given and creating something new. Graduates are able to evaluate their confidence in a thesis or judgment on the basis of logic, reliable evidence, ethical values, and openness to alternative assumptions and points of view. This outcome is measured in classroom and institutional assessments of critical thinking, scientific reasoning, and logical analysis; classroom debates and presentations; and research papers or other writing where students argue for a position. Graduates are able to listen to and express, ideas, feelings, and information in speech, text, and other media. This outcome is measured through classroom or standardized measures of oral presentations, in-class writing, reports, research papers, and multi-media presentations. desired goal. In mathematics and the sciences this goal is often practical or knowledge-oriented, in the arts often expressive or aesthetic. This outcome is measured through any challenge to students where there is no standard formula or protocol to be applied. It is assessed by analyzing the process students apply together with the quality of the end product. Graduates are able to contribute to a group task while facilitating the contributions of diverse teammates in a constructive team climate. This outcome is assessed in any group assignment where teammates evaluate their own or each other’s contributions or where the teacher observes and rates individual contributions and group interaction. Graduates are able to act in the local arena — with a global perspective — to address world economic, cultural, social, and environmental challenges. This outcome is assessed in any practical service or problem-solving activity or simulation where students’ thoughts and actions affect the wider world.